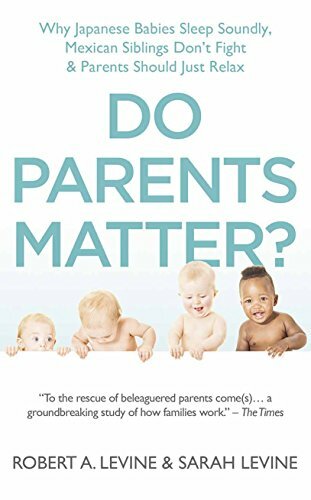 In Do Parents Matter? anthropologists (and grandparents) Robert & Sarah LeVine investigate the diversity of parenting practices across the world - from the USA to Africa, Japan to Mexico - and come away with a reassuring conclusion: children tend to turn out to be the same well-adjusted adults all around the world no matter the parenting style. Japanese children sleep with their parents well into primary school, women of the Hausa tribe (largely based in Nigeria) avoid verbal and eye contact with their toddlers; Western parenting frowns on both practices but Japanese children show higher than average levels of empathy while Hausa children seem quite content. The Levines' fascinating global investigation discovers the practices, and experiences, of parents from around the world, and comes away with profound lessons from other cultures on how to build a family. This in-depth survey of parenting practices across the world is based on almost 50 years of research, until concluding: there is no one-size-fits-all approach to parenting, free yourself from expert advice and learn to relax. Parents universally sleep with their infants in Japan. Interestingly, the infant mortality rate in Japan is one of the lowest in the world. In West Africa and many of the Pacific Islands, toddlers are sent away by their mothers after weaning and taken care of by their grandmothers or other women. Among the Gusii people of Kenya mothers deliberately avoid eye contact with their babies. For a mother to engage her infant in eye contact would be to encourage the baby's development of disrespectful habits and would undermine the hierarchy of the family. Adoption of children within family groups is found widely across the Pacific, including Polynesia, Melanesia, and Micronesia. This allows a woman who has a new-born to give her infant to a childless woman. Many such adopted children know who their biological parents are, and have happy relationships with all their "parents".